Happy Wednesday Lovelies! I want to introduce you guys to a jewelry designer I have had the pleasure of working with called Denia. She is the designer and owner of the shop Denia's Treasures. Her creations are delicate and unique. Not only are the pieces amazing but they are handmade by Denia and will add that extra spark to any look! From turquoise to silver---Denia has a piece for you! Check out some of my FAVE pieces from Denia's shop! That skirt looks amazing on you! I love the stripes & the shape - so beautiful! That top is pretty gorg. as well! Those jewelry pieces are so pretty!! I love the necklace/bracelet set in the first photo! this is such a great look! that is an amazing skirt! oh she is so cute, and has lovely style. i'm definitely going to check out her store. such a cute outfit I love the mix of stripes and polka dots. Love the mix of prints in your outfit! Super cute skirt. Love that necklcae, Ill def. check her stuff out! You look adorable in those sunnies. And your skirt is pretty amazing. lovely look dear! !in love with your blouse! Cute! I actually love your stripey skirt - Great Find! Absolutely adorable as always! Love that skirt on you. and that jewelry is fabulous! i love how dainty all the pieces are! Love the polka dots and stripes combo. You look adorable, as always! Beautiful outfit :)) amazing skirt !! SOOOO cute! 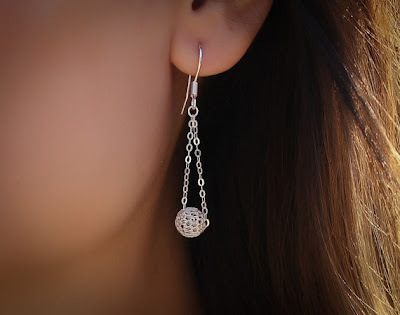 I don't usually like dainty pieces, but these are amazing. Also, your top and skirt are to die for! You look SO cute - like Zoey Deschanel-ish! I adore your style. I'm obsessed with anything evil eye! that necklace is amazing! such a cute outfit! Love the evil eye necklace, I've been wanting one since the one I got in Greece broke. great post, check out my blog to win JBRAND jeans! Very pretty! I love the skirt! I love your top! I have seen that the top is from Forever 21, i love this shop!! You look gorgeus! I like your style, you always look perfect! Absolutely obsessed with this skirt! I've been looking for an evil eye jewelry piece, but haven't found one I love yet. This one is super cute! 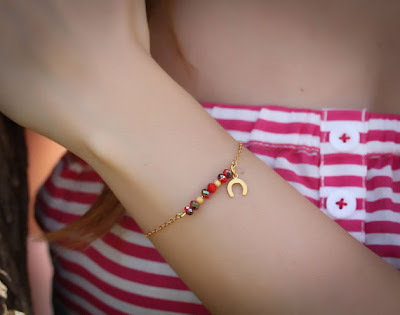 Love the jewelry, and love your pattern mixing - so cute! cute looks! I love your skirt as well. 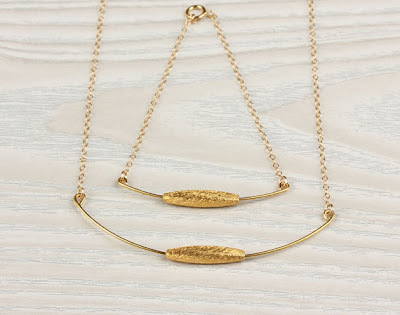 These jewellery designs are so lovely and delicate. I adore the print mix and that stunning red bag! Terrific look! what an adorable combo! loving the polka dots & stripes. Love the outfit and that jewelry is awesome! Good find. Would love for you to check out our new post! I love your style. Such a lovely post. Totally agree with Courtney, you look like Zoey-ish! You are just a beautiful girl!! Love the dots with the stripes! gorgeous style! i've just fallen in love with your blog! don't be jealous!! you're so cool also without a chanel!!! Love the mix between dots and stripes, very nice!! I love your shoes! you look really cute in this outfit! how cute is your skirt!!! Love it! I love the delicacy of the pieces! And a note on your outfit: I just love the wide stripes on your skirt! Love the polka dot shirt! (I have the same one!) And the jewelry is really pretty too! You look so adorable in these shots! Ooh I love the bold stripes of your skirt! Love your shirt & bag <3 <3 You look very cute!!!! Love the polka dot and stripe combo! :) Your blog is awesome-just became a member/follower of your blog. I hope you'll follow me back and we can keep in touch. Happy Blogging!!! This is such a nice retro kinda look. oh wow you look totally awesome <3 i love top <3 would you like to follow each other? I love the skirt and necklace! Beautiful. So pretty! I love your mix of prints too! 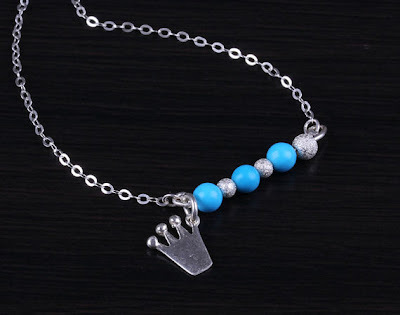 Cute jewelry! Your outfit is also really cute- love the color combo! The skirt is so perfect, and I like how you have mixed the polka dots with the stripes. But, you now have me wanting that evil eye necklace most of all.